Stock photo of a white Canadian police car of the RCMP Police Academy, City of Regina, Saskatchewan, Canada. A Canadian police car with it's brightly colorful logo of the RCMP Police Academy, City of Regina. 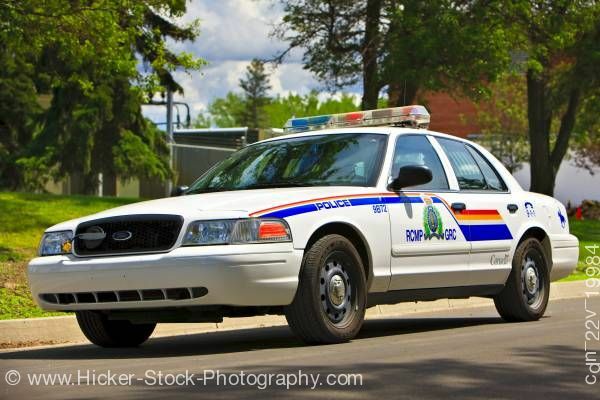 This stock photo shows a white Ford Canadian police car of the RCMP Police Academy, City of Regina, Saskatchewan, Canada. The police academy car is a white Ford four-door sedan with it's brightly colorful logo of orange, yellow, white and blue stripes down the side panel and widen on the door panel of the car. Also on the door is the RCMP GRC lettering with the green and blue emblem. The roof of the car has the blue and red siren lights. The police academy car sits at a curb on an asphalt street. Behind the police academy car is a common area with a mowed lawn and a few adult trees and buildings for the background. The sunny day with a bright blue sky and large puffy white clouds reflects the car's shadow on the street along with a tree's reflection.